S’bu and Shauwn Mpisane are returning to their roots to give something back to the society which helped them get where they are today. THEY’RE known for throwing lavish parties with gourmet food and expensive drink, and the generosity they show their guests never seems to run dry. 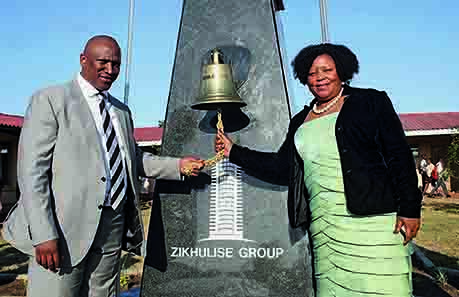 Now Durban’s mega-rich celebrity couple S’bu and Shauwn Mpisane – owners of Zikhulise Group – are returning to their roots to give something back to the society which helped them get where they are today. They have donated over R20 million to refurbish Inhlakanipho High School in KwaMashu, north of the city, where S’bu was a former pupil. “Let me see if I can still fit into one of these desks,” S’bu says with a laugh at the handover ceremony, held on Youth Day on 16 June. Then it’s on to more serious matters, and exactly why the Mpisanes have spent a fortune ensuring today’s youth get a better education, here at least. “We’re here today to change the shameful conditions of the past and start a journey to a future of success,” S’bu says at the celebrity-studded occasion.